Part of the article series Looking at Gamification: Personal Viewpoints. 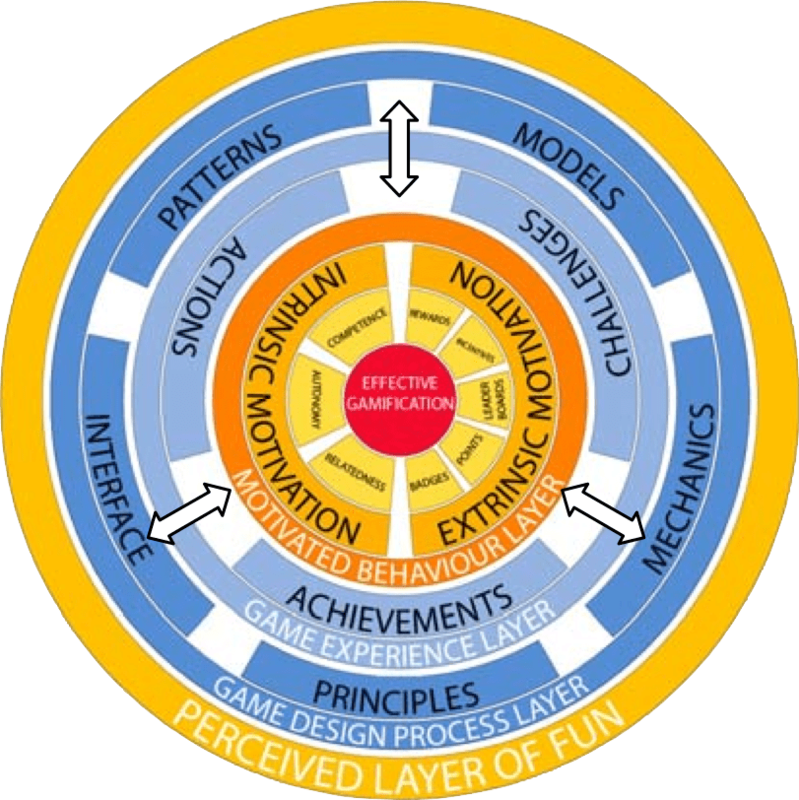 Ask any academic what the term “gamification” means and they will no doubt provide you with an informative cascade of phrases related to system design, repurposed game mechanics, “tangible progression,” motivation, and task management. However, like verbose snowflakes, no two answers will be the same. In fact, a number of papers regarding gamification have been written for the sole purpose of defining the term (including one co-authored by our group director). Game-ification: to transform into a game. 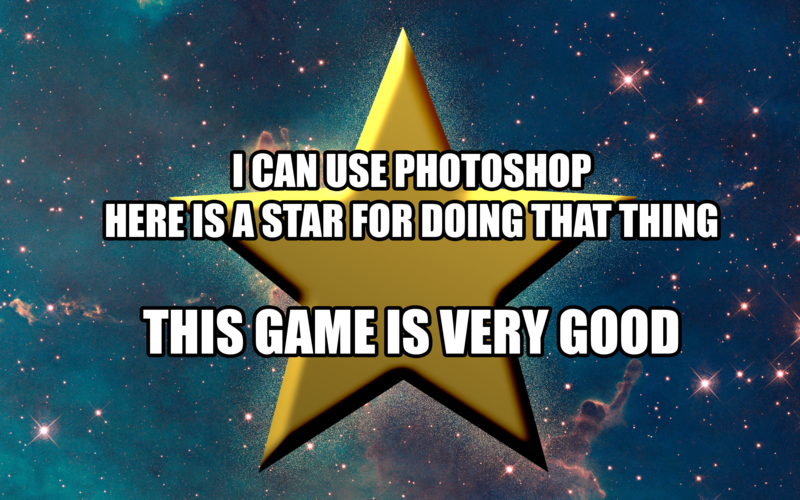 Despite our little simplification, let’s face it: good gamification is hard. There are a massive number of experiential factors that actually define “fun” in a gamified application, and designers need to consider everything in building a cohesive system. See this paper for a more detailed example of the intricacies involved (and the cool image above with all the circles). You can see why the definition sparks so many debates. What exactly makes something “gamelike”? Are there different degrees of “gameness”? How many design modifications are necessary before something can make the transition from “productivity app” to “gamified productivity app”? Does there come a point where we drop the “productivity” part entirely, and the creation simply becomes a “game”? All of these questions are equally intriguing. To my mind at least, one of the most pressing questions is this: What should and should not be gamified? A quick internet search (or a few months of bombarding oneself with literature reviews) reveals that the vast majority of gamification is aimed at making “healthy” or “productive” tasks (such as completing work, exercising, and dieting) more entertaining. A cavalcade of mobile apps offer gamified to-do lists, and various websites and bona fide console games claim to motivate good exercise habits. Corporate achievement frameworks laden with tediously cheerful stock images promise increased employee loyalty and brand recognition. It quickly becomes apparent that there is a large market ready to welcome any and all platforms that magically allow work of any sort to be transformed into something entertaining. Any tasks falling outside of this category are generally completed out of want rather than necessity (eating pecan pie, for example), and thus do not require such enhancement (I am a firm believer, however that eating pecan pie can and should be gamified, though I’m pretty sure that a number of different county fairs have beaten me to the proverbial punch). Following from this, we might be tempted to throw a game design textbook at every work task we encounter. If we’re going to gamify to-do lists, then why not gamify each and every task in itself? What about gamified word processors, or filing cabinets with tiny dragons inside disorganized folders? We almost immediately run into the issue of diminishing returns, which then spiral into accumulated losses. Keeping up with gamified apps, checking lists, reporting progress, and enjoying game rewards all take time, which will eventually cancel out the productivity gains resulting from increased motivation. Balance, as in everything, is key. Gamification can only serve us as intended if we are careful to apply it with a steady hand. A further challenge arises in making sure that the final product is actually entertaining. Frankly, I’ve always been skeptical of gamification’s ability to produce genuinely enjoyable experiences that deserve to be classified as “games”. Upon listening to the marketing speech associated with most gamified apps, I can’t help but conjure images of a desperate preschool teacher convincing her students that nap-time will be fun if they just cooperate. The phrase “extrinsic motivation” screams of forced points systems and tacked-on badges and achievements. I don’t find the promise of “one hundred jewels” (whatever “jewels” are, in this era of microtransactions) or a shiny gold icon with a star on it to be motivating in the least. I’m an adult human being, not an uncooperative three-year-old, and I crave a meaningful experience. Dear game designers, please don’t. In the hopes of finding such an experience, I decided to finally sign up for HabitRPG, a gamified service that my labmates enjoy tremendously. In essence, Habit is a fairly complex to-do list, spruced up with customization, themed collectibles, and social features. It’s fairly easy to get into, and seemingly addictive, with a simple, straightforward premise: set your own goals, and earn trinkets and prestige for completing them. The playful theme doesn’t take itself too seriously, preventing accusations of unintentional corniness. I find the sense of progression afforded by the game’s digital rewards to be sincerely enjoyable. However trivial it may seem, the minor victory of unlocking a pixelated sword after striking off a few to-do items is certainly satisfying. After a few days, I’ve grown to enjoy checking in, and participating in a group with my colleagues definitely enhances the draw of the experience. 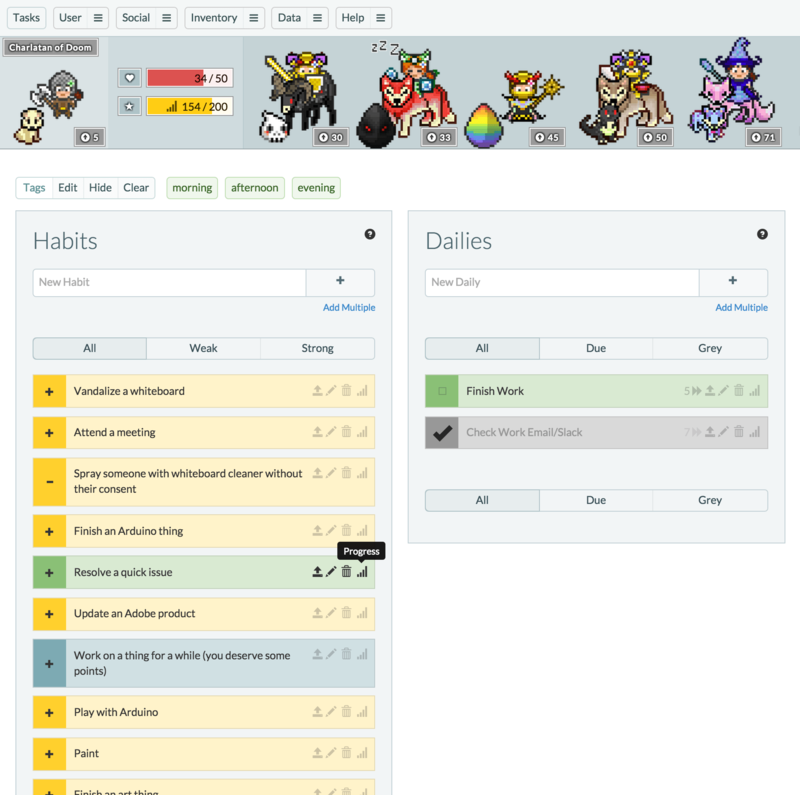 HabitRPG’s interface is populated with customizable task lists and the [admittedly adorable] avatars of party members. Quite a bit more enjoyable than a notepad with a to-do list scrawled out in pen and covered with dried tears. That being said, however, I’m not sure if I’ll have the gumption to keep up with Habit after my little experiment. Sure, it’s entertaining, but I already have plenty of hobbies, not to mention work, and not a lot of time to spare between them. I don’t feel that the game significantly affected my work habits, and I’ve never really had trouble motivating myself to complete work tasks, though this is probably due in large part to the fact that I genuinely enjoy my job. Still, I did find the experience oddly (for me, given my typical disdain for entertaining productivity) fun, and was drawn back to it out of more than a desire to observe its characteristics. Only time will tell if I’ll be able to remain interested in Habit, or any other gamified app, for an extended period, though in the meantime, I’m happy to continue ticking off my tasks, and unlocking the latest gear for my avatar. 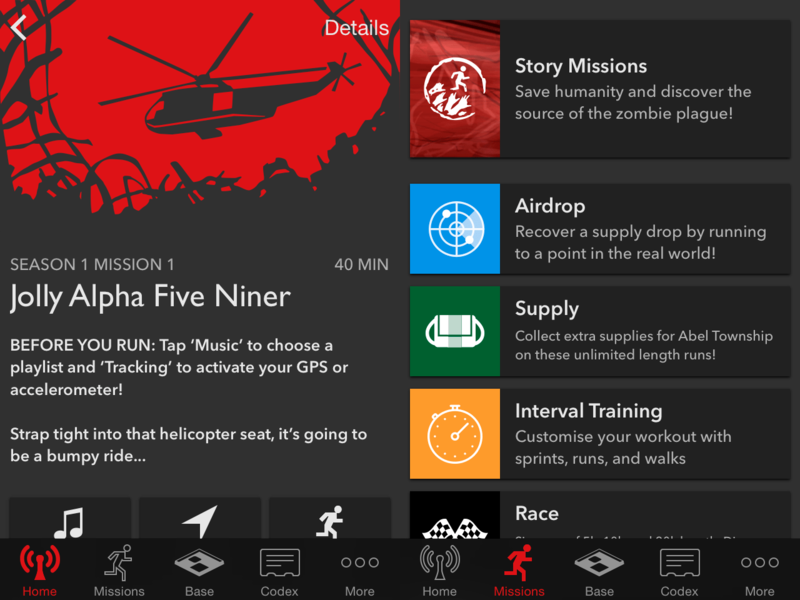 Zombies, Run!, an app that abandons traditional point-based systems to motivate exercise by immersing users in an intermittent zombie apocalypse during their workout. This app looks like it might actually be good enough to make me start exercising on purpose. Chore Wars, an old-style Dungeons and Dragons-esque game for knocking out housework. The integration of social family features promises to create some interesting household dynamics. Duolingo, an app designed to assist in learning a new language through simple activities and reward mechanics. I found this one particularly interesting because it focused on acquiring new knowledge, rather than on work or exercise like many other apps. Designs like these challenge the idea of what “entertaining productivity” can be, providing imaginative content worthy of a notable time commitment. Therefore, despite my initial cynicism on the matter, I’m more than willing to accept that, when done with intelligence and care, gamification can produce excellent results. Such products need not fall prey to the allure of shallow, thoughtless mechanics, or motivational overcompensation. A truly gamified entity delivers successfully on both productivity and enjoyment, deserving of the ‘game’ categorization in its own right. Gamification is a powerful tool, and a versatile medium in which to explore the future of not only entertaining productivity applications, but the creation of meaningful and immersive player experiences that connect meaningfully to the real world.